Union Home Minister Rajnath Singh said today that Indian Muslims would never allow terrorist outfits such as IS to have a base in the country. 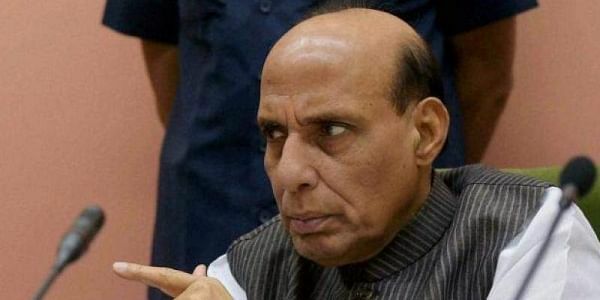 VARANASI: Dismissing reports of the Islamic State gaining a foothold in Kashmir, Union Home Minister Rajnath Singh said today that Indian Muslims would never allow terrorist outfits such as IS to have a base in the country. Singh also said he has complete faith in the Indian youth that they would not let IS misled them. "Any Indian Muslim who believes in Islam would not allow any opportunity to the Islamic State to have a base in the country," the Union home minister said. His remarks came in wake of claims that the global terror outfit was involved in an attack on security forces in Srinagar on November 17 in which a terrorist, Mugees, was killed and a sub-inspector, Imran Tak, lost his life. The terrorist group claimed the attack through its propaganda news agency, 'Amaq'. Photographs of Mugees with the IS flag had surfaced on the social media. Even his body was wrapped in the flag of the banned terror group during funeral. Singh urged the young men, who live near the IndiaPakistan border and who have been misled into joining terrorist groups, to return to the mainstream, saying proper assistance would be provided to them. Singh dismissed reports about IS gaining a foothold in the Kashmir Valley and said there was no confirmation about such reports. He said the matter was being investigated by security agencies and any conclusion should be arrived at only after their report was submitted to the government. Commenting on the recent military standoff with the Chinese Army in Dokalam area in Sikkim sector, Singh said India wants cordial ties with its neighbours and even Chinese president Xi Jinping has expressed his views on this. Indian and Chinese armies were engaged in an over two month-long military standoff in the Dokalam area, which is claimed by Indian ally Bhutan, after Chinese troops tried to build a road. New Delhi opposed the construction of the road, fearing it would allow Beijing to cut off India's access to its northeastern states. The Union home minister also visited the house of Hindi author Manu Sharma, who died earlier this month, in Varanasi to pay his respects.